German police are investigating a woman who is alleged to have put her eight-year-old daughter up for sale on the internet. The girl's picture was posted on the eBay auction website with a starting price of one euro ($1.19). "You can play with her" read the sales' pitch, allegedly put up by the mother and her boyfriend. 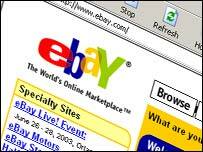 Police in the western town of Rennerod were alerted to the "offer" by an eBay user, French news agency AFP said. Three bids had reportedly been made by the time police removed the ad - the highest for 25.50 euros ($30.35). The senior public prosecutor in the western city of Koblenz, Erich Jung, told BBC News Online that police were continuing their investigations into the incident. He confirmed an "offer" for the child had been posted on eBay by a 41-year-old woman and 35-year-old man. But he said their motives were as yet unclear and the police had not ruled out the possibility that it was simply a bad joke.